PreNeo Press is the conceptual and collaborative space of Kent Manske and Nanette Wylde. Redwood City, California: PreNeo Press, 2017. Edition of 55. 6 x 18"; 7 folios. Letterpress and screen printed (46 press runs, in 25 colors). Windsor, Myriad, and American Typewriter fonts printed on Speckletone Kraft papers. Laid in a printed trifold portfolio. Signed and numbered by Wylde and Manske. A collaboration between Nanette Wylde and Kent Manske. The stories are by Wylde. Illustrations, printing, and design are by Manske. PreNeo Press: "Portfolio of seven letterpress printed folios, each with wood-type printed cover, two color interior screen print illustration, and original story which explores the diversity of meaning in food related language. The foodie vignettes are: Can, Chop, Grill, Jam, Pickle, Poach, and Salt." 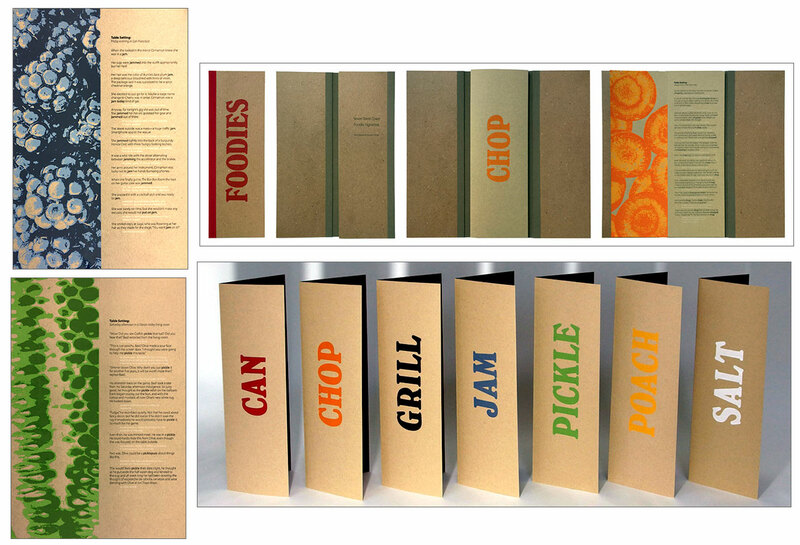 Prospectus: "Foodies is an artists' book which explores the diversity of meaning in food related language. Each story has a contemporary theme, employs its title word in as many different definitions as is possible, and begins with a West Coast table setting. For example, Can takes place midday at a truck stop outside of Los Angeles and Chop during Happy Hour in the North Bay." Redwood City, California: PreNeo Press, 2012. Edition of 7. 20.5 x 6"; 5 leaves. Printed in ITC Leawood font on Mohawk Superfine paper. 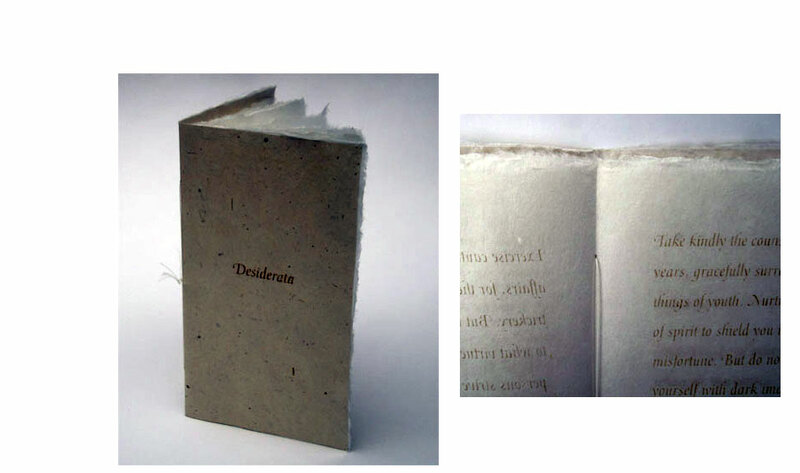 Pamphlet bound in St. Armand paper. Shaped covers of tugboat with hemstitching. Inserted in wave shaped blue paper with stitching. Nanette Wylde: "Tugboat originated from a randomly generated text prompt. I had previously created a project – focusgenerator.net – which provides random prompts for the purpose of creative investigation. I initially created focus generator as a means to practice for a poetry writing project I created with a friend called 'Spontaneous Word Combustion.' We write poems on-the-spot at various events, generally as a fund raising activity. "Upon making the book, I wanted to reinforce the female aspect of vessels including the vessel that is the ocean. Thus the water body that holds the tugboat book; and the inclusion of stitching, which is different from fishermen's netting." Redwood City, California: PreNeo Press, 2009. Edition of 7. 4.5 x 9"; 5 leaves. Laser etching on Kozo. Pamphlet bound. 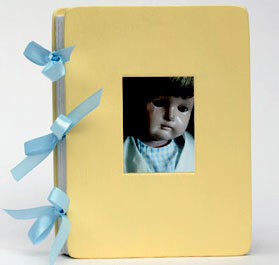 Sewn binding. Nanette Wylde: "When I was nineteen I found myself, suddenly and unpreparedly, in the army. This is a long story, but the short of it is that I had a breach of service contract, and since it was not a good fit for me, I was sent to a fort in Virginia to work while awaiting discharge. Taped upon the wall of my bunk at the new barracks was a small poster of Max Ehrmann's poem, Desiderata. The poem saved me. Reading and reciting it internally became an integral aspect of my remaining time in the army. So much so, that since that time many years ago, Ehrmann's words have often come to the forefront of my conscious at times of need, and I think about how his words apply to the situation at hand. 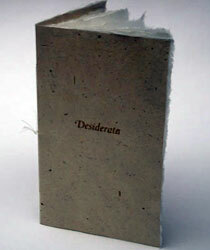 Desiderata is etched into my being, and so I etched it into some lovely kozo paper to make this book." Max Ehrmann (1872 - 1945) was an American writer, poet and attorney from Terre Haute, Indiana. Redwood City, California: PreNeo Press, 2004. Edition of 5. 5 x 7"; 30 pages. Pigment prints. Printed on Epson 2000P using Sanvito Font. Bound in boards with image tipped on front. Ribbon ties at spine. Text author unknown. Images and concept by Nanette Wilde. Signed and numbered by the artist. Nanette Wylde: "Based on a poem I memorized in fifth grade. ... For most of my adult life I have been periodically haunted by a poem I memorized as a child. The text would run through my head for days on end and then I wouldn’t think of it at all for several years. 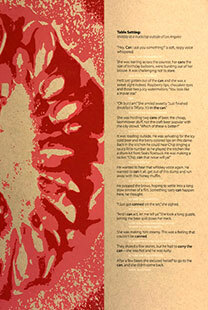 In 2004, I decided to do something about this and created an art project around the poem, Abandon. "The project consisted of three pairs of children’s sized chairs. Each pair was painted a different color — pink, blue, yellow. The pairs sat facing each other. On one chair was a framed portrait of a doll, approximately 14″ x 20″. The other chair contained headphones with a nine minute audio reading of the poem by a variety of voices. The gallery visitor sat on the chair with audio, listened to the poem while looking at the portrait across from her. 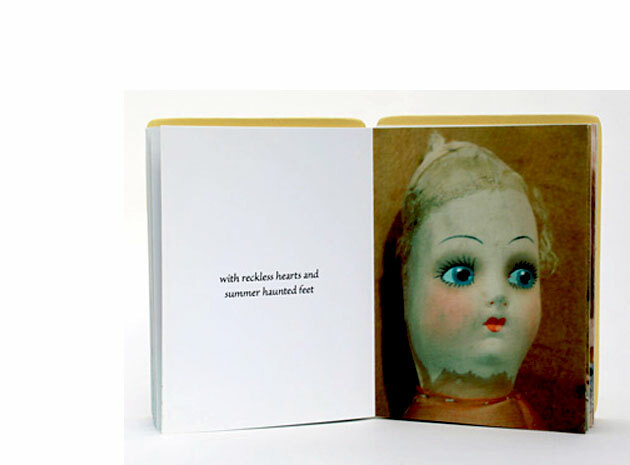 This book was also a part of that larger installation." and find the breast of beauty in a field.